Welcome Illinois High School Association (IHSA) coaches and athletic directors! We are proud of our long-time affiliation with the IHSA, and we look forward to training IHSA coaches in the 2018-19 school year and beyond. 3. Sport First Aid course. The IHSA by-laws course is a separate course with a separate test, but it is sold/bundled with the Coaching Principles course and with the IHSA Coaching Orientation course. It is not sold separately. Purchase courses in one convenient package and save! As Coaching Principles and Coaching Orientation both satisfy the general coaching principles portion of the IHSA requirement, we've created separate discounted packages featuring either course. After adding each individual course (IHSA Coaching Orientation and Sport First Aid) to your shopping cart*, enter the promo code IHSACO, and you’ll get them for the combined price of $100.00. That’s a savings of $13, and you don’t have to pay for shipping! Purchase print-book courses in one convenient package and save! As Coaching Principles and Coaching Orientation both satisfy the general coaching principles portion of the IHSA requirement, we've created separate discounted packages featuring either course. IHSA Coaching Orientation Online Package $110.00 You save $13! To purchase online courses together at a discount, follow the instructions for purchasing a single course above, and from your shopping cart page, click on the "continue shopping" tab. You'll be taken to the home page from which select "view requirements" tab from the lower right menu, and choose "Illinois High School Association (Coaches)" from alphabetical listing of organizations. You'll be taken to this page, from which you can add the second course to your cart. When purchasing two e-book courses, be sure to enter the appropriate promo code to earn your discount (see above). If you prefer to take Coaching Principles and Sport First Aid as classroom courses, you need to register for the classes through a certified instructor in your area. Visit the Classroom Course Finder for a schedule of upcoming clinics in Illinois. After enrolling in a classroom course, you will receive course materials from your instructor on-site the day of the clinic. You cannot register for a classroom course through the website; all registrations for classroom courses are through the instructor. IHSA Coaching Orientation 2E is an online course gleaning material from the Coaching Principles, Sport First Aid, and Coaching [Sport] Technical and Tactical Skills courses. 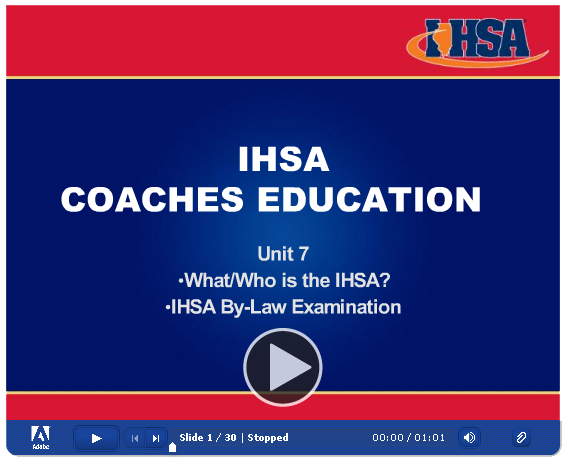 Included with IHSA Coaching Orientation is the IHSA component and bylaws exam, covering IHSA-specific information on policies, procedures, rules, and reporting requirements.